Sheroes: Diana Ross – FREE ENTRY Thursday! 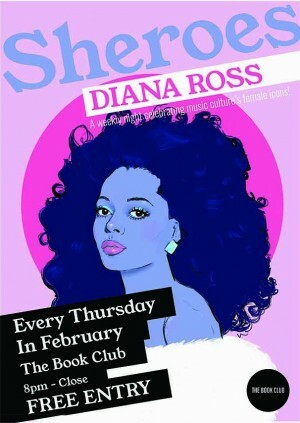 Sheroes: Diana Ross - FREE ENTRY Thursday! Join us every Thursday in February as we celebrate the one and only Diana Ross. Singer, songwriter, record producer and style icon, Diana Ross is a true artist and innovator who has been a driving force of music and contemporary culture over the past 40+ years! In a remarkable career, Diana Ross has proven herself the consummate music artist as well as one of the most iconic female singers of all time. Beginning in the sixties, as lead singer of the world renowned group, The Supremes, and as a solo performer Ms. Ross achieved the unprecedented feat of twelve number one singles in the USA, rivalled only by The Beatles for the position of the biggest hit group of that generation. In 1970, Ms. Ross moved to a solo career and for more than three decades has continued to produce an endless stream of chart singles and sell-out tours, at the same time showing herself to be also a high achieving business woman unafraid to take on new challenges and new directions which her remarkable career have brought to her. So this February, Sheroes Is dedicated to a stalwart of the music industry… Diana Ross! Sheroes is a free weekly event which celebrates female music and style icons that have created a lasting legacy in pop culture. Focusing on a different artist each month, a pool of resident DJs play a selection of their favourite tracks by the artist as well as selections that have influenced these DJ'S wider music collection and party music by female artists from across the music industry!